Maybe you’d enjoy a malty and sweet beer! Sweet and malty beers are for anyone who loves bold flavours. These are the perfect beers to crack during seasons where the leaves change colour. So put away your summer brews and stock your fridge with sweet, malty brews that will have you feeling warm on the inside on a crisp day. If you’ve got a passion for sweet, dark, and flavourful beers, then these are for you. These beers have strong malt flavours. The palate of malty beers can have varying levels of sweetness and deep notes of nuts, caramel, toffee, bread, and dark, dried fruits. Malty beers usually range in colours from light copper to dark brown. They can be light to full bodied and low to high ABV%, depending on the brewery and the brewer’s preferences. 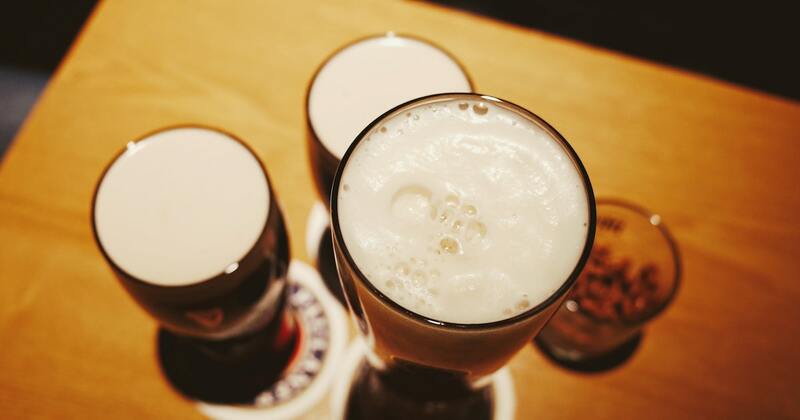 What are the most popular malty and sweet beers? Malty and sweet flavours in beer isn’t a huge trend in the macro beer industry. Most large breweries don’t have the ingredients, or time to focus on creating strong malt flavours in their brews. Although, a popular beer that is known for being considered sweet is Newcastle Brown Ale. If you like Newcastle Brown Ale, you like sweet and malty beers! Newcastle Brown Ale is auburn in colour with a rich full-bodied flavour and a slightly sweet finish. The recipe was developed by Colonel J. Porter, aka “The Original Dogwalker”, in 1927 in Newcastle, England. In Newcastle, England, “Walking the Dog” is Geordie slang for hitting the pub for a Newcastle Brown Ale. It’s a bit of code to use when you’re looking to meet friends and enjoy a couple pints of Newcastle Brown Ale. Don’t worry, you don’t need a dog of your own to enjoy one of these sweet, malty brews. What beer styles are considered “malty & sweet”? Even though sweet and malty beers share a lot of characteristics, they also vary in a lot of different ways. Many different beer styles fall under the beer profile of malty and sweet. Toasty and nutty brews combine notes of mild crispiness with very bold, bready malt flavours. Toast, nutty, biscuity, and graham-like notes area always strong. More intense and strong beers sometimes show touches of roasted or dried fruits like raisins, figs, and dates. While these beers have bright dried-fruit notes, they also carry a strong malt presence. Mild fruit aromas balance out the sweet caramel and toffee flavours. When searching for foods to pair with malty and sweet beers, it is important to highlight the malt profile. Root vegetables, bold cheeses, tomato-flavours, pork, and cured meats are all great pairing options. Our favourite? A Hawaiian-style pizza, with extra cheese of course! If you’re ready to try some malty and sweet brews, you should start by trying beers that have similar flavours to ones you already know you love. If you are a fan of “sticky-toffee” anything, you will probably love Sticky Toffee Pudding Ale by Charles Wells Brewery. If you can eat Werther’s Original by the handful, try a bottle of Old Stock Ale by North Coast Brewing Company. If you’re a fan of dark fruits like raisins or figs, you might like by Oatmeal Raisin Cookie by Cigar City Brewing. If you’re struggling to find the perfect sweet and malty beer, let us help you out. Below is a list of our favourite sweet and malty brews from Canadian breweries.